Home » Blog » Don’ Wait, Decorate! If you focus on function more than form you can actually achieve a beautiful look even the youngsters can enjoy. How many of you are sitting at home as you read this with kids in the background, playing, screaming and carrying on!? We feel for you! Everyone deserves to have a beautiful home even with rambunctious kids running around. You can design your interior space even with the hustle and bustle of everyday life with the kiddos. Here’s how…. Many families wait until their children have grown out of the crazy toddler stage to begin designing their interior space the way they really want it done. If you focus on function more than form you can actually achieve a beautiful look even the youngsters can enjoy. Just because you have kids doesn’t mean you don’t deserve a well-designed sippy cup friendly space. You can start by rearranging the furniture to create more of an open floor plan. Kids have to have that space to run around and act like monkeys! Give them some room and maybe even ask them for their opinions. Who knows, your child could be an interior designer some day! After moving the furniture around, we suggest anchoring the space with an indoor/outdoor rug. It should be big enough to fit at least the front feet of all the furniture. An indoor/outdoor rug wears well and can resist many stains left by children, dogs and even husbands. Ha! Worst case scenario you can take that rug outside and hose it down if it gets really dirty! Now let’s talk upholstery. Outdoor fabric has come a long way in the past several years and if you’re looking to reupholster a chair, ottoman or even a sofa, outdoor fabric will hold up amazingly well! There are even plush outdoor chenille fabrics in multiple colors and patterns to choose from. When thinking about a new sofa fabric specifically, we recommend a darker color like a charcoal grey or a rich khaki. As for your pillows– those can be your punch of color and designer touch! We think you should splurge on some nice down filled pillows. Throw pillows can make or break any room in your house! Pillows are fun and easily replaceable. Last but not least…. Artwork! As parents, I’m sure the kids come home with artwork almost every week. Personally, I know there are so many pieces that my daughter brings home that I am forced to pack some in storage and also display “the chosen ones.” Pick some of your child’s favorite paintings or drawings, frame them and hang them up! Your children will love seeing their original pieces hanging on the wall, and it will definitely inspire them to be creative and ambitious. 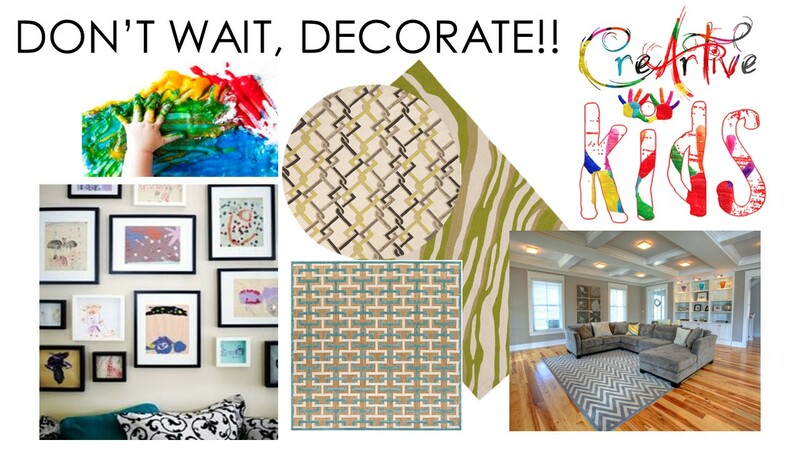 So, when should you begin redesigning your family space you ask?! Right now! Barry has even decided to extend our currently ongoing BIG SALE til the 6th of February! All in stock rugs are 50% off and all pillows are 60% off. We hope to see you soon!